Why is literacy important to you? Christine Fonseca: As an educator and a mental health provider, as well as a writer, I see first hand the impact of literacy on educational function, esteem, resiliency, and overall functioning. Improving literacy practically guarantees improved outcomes for kids - how could anything be more important than that! Jodi Burrus: Literacy is the key to an endless number of doors. Walk through one and ride dragons. Through another and discover why the sky is blue not black. It's a time machine, a crystal ball, a microscope and a magic wand. In short, it's the single most extraordinary gift you can give. T.S. Tate: Literary builds bridges. It doesn't manifest in brick in mortar or steel and iron. It's bigger than that, purer than those menial things. Literacy makes clear the path to new worlds, renews old hopes and sparks the possibility of limitless tomorrows. Without the most basic comprehension of these roads built in syntax and syllables, there would be no freedom, no joy in what future is laid before us. Without literacy the soul would be a vacant, empty thing unable catch the smallest breath. Judith Graves: Literacy is crucial to development - of the person and of the society. It is the ability to read and understand what is written, but more importantly literacy provides the inspiration to apply that understanding to the betterment of others. Literacy is a successful job application. A completed novel, short story, or tax form. It is a lost child able to recite their address and phone number so they can make their way home, or a parent sharing a beloved bedtime story, it's the hopes, dreams, and fears of generations, civilizations, and the kid down the street writing in her diary. Literacy is the master key to a untold riches hidden in millions of buried treasures. Let's unlock them together. Heather McCorkle: Books taught me many of life's lessons that I wouldn't have learned otherwise and they offered both escape and adventure. More than that, they showed me that anything is possible within the pages of a book. Everyone deserves the chance to discover that kind of magic. Tina Moss: As a lifelong reader, literacy is a fundamental part of my core beliefs and values. It allows people to experience a world outside of their personal sphere. Opening minds to different perspectives, creating cultural awareness, starting a dialogue, and infinitely more possibilities, these are the benefits of reading. The Internet, ebooks and the advent of the technological age has proven people are far more alike than different. But one cannot live on animated gifs and YouTube alone. Literacy is the key to creating a more tolerant place for all of humanity. I believe it no exaggeration to say that while food, water, and shelter are the necessities for survival, love and literacy are the necessities for life. 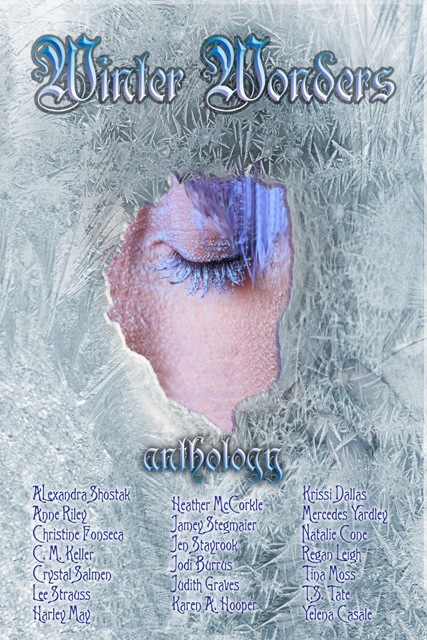 A unique anthology filled with genres to suit every taste, all tied together with a winter theme. You'll find everything from contemporary love stories, tragedies, and triumphs to steampunk cyborgs, dystopian worlds, and dragons. Anne Riley, Alexandra Shostak, Christine Fonseca, C.M. Keller, Crystal Salmen, Lee Strauss, Harley May,Heather McCorkle, Jamey Stegmaier, Jen Stayrook, Jodi Burrus, Judith Graves, Karen Amanda Hooper, Krissi Dallas, Mercedes Yardley, Natalie Cone, Regan Leigh, Tina Moss, TS Tate, and Yelena Casale. All proceeds of this novel will go toward a remarkable charity that fights illiteracy and encourages young people to read. Winter Wonders can be found on Amazon in paperback and eBook, and on Barnes & Noble in paperback and eBook. It is truly a fabulous read for a FABULOUS cause! Thank you for the shout out ladies! This anthology is a labor of love that we're all very proud of. Thanks so much for taking the time to read, ladies. So appreciated. Thanks so much for featuring the anthology on your blog, ladies. Literacy is such an important cause to all of us, and it is book bloggers, like you all, who help spread the message that the gift of reading is priceless. You are all so welcome!